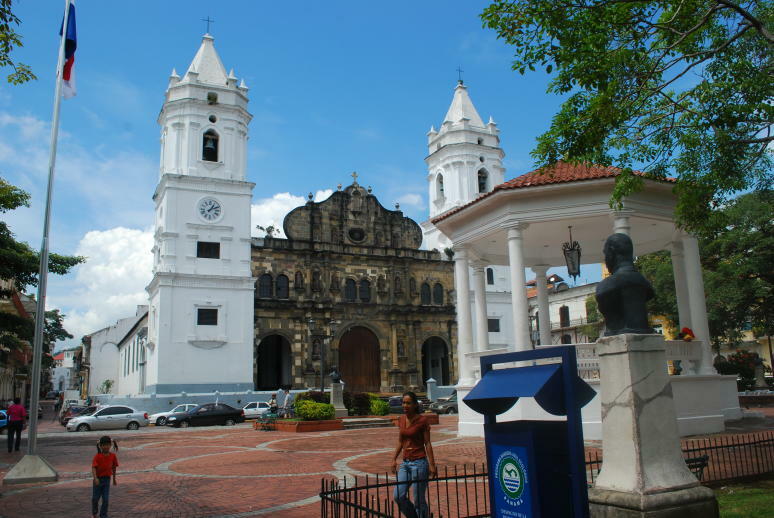 In 1671, the city of Panama Viejo was pillaged and burned by Henry Morgan and his band of pirates leaving only one of its many churches standing. 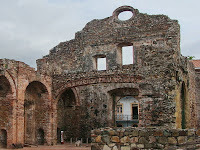 After the survivors relocated to a rocky peninsula on the Bahía de Panama to start all over, not only did they construct a walled city but it included one of the largest churches in all of Central America. But as the city prospered, it had simply become too crowded and the population scattered northeast into what is now modern-day Panama City. By the latter half of the 20th century, this historic quarter (known as Casco Viejo) had become something of the past. The approximately 800 buildings including several churches fell into serious disrepair. 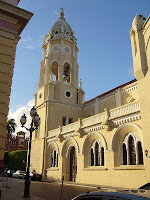 Fortunately in 1997, the World Heritage Site organization realized its true worth and added Casco Viejo to its select list. Since then, wonderful changes have been made especially due to a massive urban development project that has painstakingly restored many of the structures into their original brilliance. Today, the quarter is also known by several other names such as San Felipe, Casco Antiguo, and of course, Casco Viejo. The churches in particular are some of the most picturesque and historically interesting with architectural styles that range from French and Spanish Colonial to baroque and neoclassical. 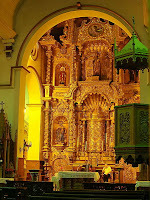 In addition to its excellent museums and historic plazas, its churches should definitely be explored by any visitor. Iglesia Santo Domingo and the Arco Chato – Located on the corner of Avenida A and Calle 3 are the ruins of the Church and Convent of Santo Domingo. Built in 1678, it thrived until a fire devastated the building in 1756. Unfortunately, all that remains today is an outer shell that was never rebuilt. For more than three centuries, its entrance included an interesting flat arch known as the Arco Chato. At a height of approximately 35 feet with a 49-foot span, it was mostly noted for its lack of external support. This structure was so impressive that it was constantly cited as a powerful example of the country’s seismic stability when the United States considered taking over the Panama Canal project. But in November 2003, after centuries of neglect, the arch finally gave in and collapsed. Today, the ruins are being restored with eventual plans that include cultural and artistic presentation space for the public. 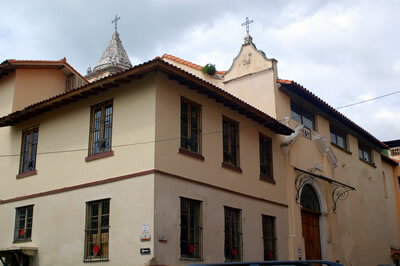 Iglesia San Jose – Located at the corner of Avenida A and Calle 8 is this church that dates back to 1673. 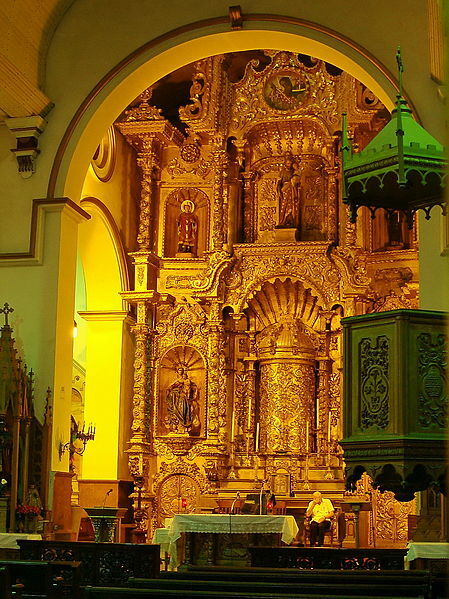 Although it has since been remodeled, it is mostly known for its decorative baroque Golden Altar, one of the few treasures that survived Henry Morgan’s raid of Panama Viejo in 1671. According to a local legend, the altar was painted in black to disguise its real value. It consists of carved mahogany that is painted and veneered in gold. Iglesia San Francisco de Asis – As seen in the photo at the top of this post, this is one of the smallest but most decorative churches in Casco Viejo. Built in the 17th century, it was devastated by a major fire twice: once in 1737 and again in 1756. Fortunately, it was beautiful restored in 1998 to what you see today. The church is generally closed during non-service hours but you can go to the parish office on Avenida B and ask to look inside. Generally, someone is usually willing to let you look around. Compared to its beautiful facade and bell tower, its interior is relatively uninteresting except for a wooden confessional that dates back to 1736. It is located next to the Plaza Bolívar. La Iglesia San Felipe Neri – This small church was established in 1688 and it is one of the oldest in the area. It has served in many different roles ranging from a school and a seminary to a nursing home for the elderly. It has undergone several extensive restorations with its latest in 1995. 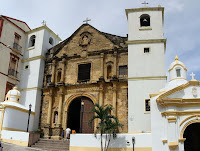 Iglesia de la Compañía de Jesús – Located at Avenida A and Calle 7, this Jesuit convent and church was built in 1673, just before the Spanish banished the Jesuits from the colonies. Around 1740, additional structures were added to accommodate a school that later became the first university in the city. Unfortunately, the entire complex burned down in 1781 and was never rebuilt. To make things worse, an earthquake in 1882 further damaged the structure. But today, it too is undergoing a thorough restoration. 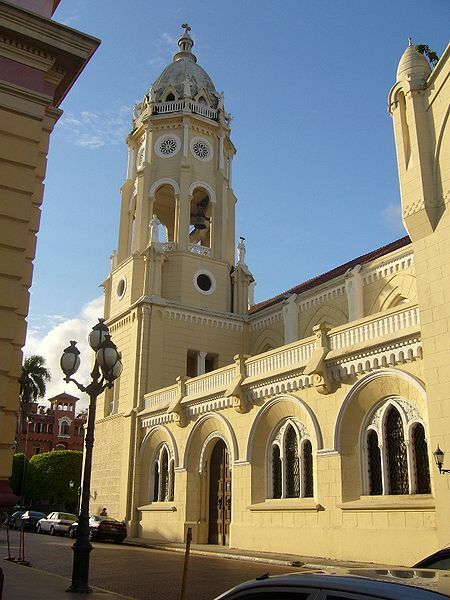 La Iglesia de la Merced – Located at the corner of Avenida Central and Calle 9, this church dates back to 1680. Much like its larger counterpart, the Catedral Metropolitana, its baroque facade was built with stones from Panama Viejo and its two white bell towers stand in stark contrast to the darker stone entrance. I haven't heard this before. Thanks for a new information and story. church loan necessity is immense to the church developer or church administration. Sometimes for paying off debts and sometimes for constructing a church, it's really important.